Deflation watch continues. The following graph from Bank of Japan is the most damaging chart I’ve seen for a long while (hat tip to John Taylor and his blog). US policy makers still have chance to revert the course. But so far, they just look all too similar. Will the Fed roll over asset purchases? Two former Fed. 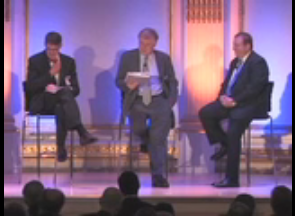 Board of Governors (one being Fred Mishkin) discuss the issue. Fed’s action in coming weeks is likely to have a big impact on both bond market and currency market. Mishkin took the view that it would be a mistake for the Fed to continue buying asset-backed securities or buying treasuries directly. 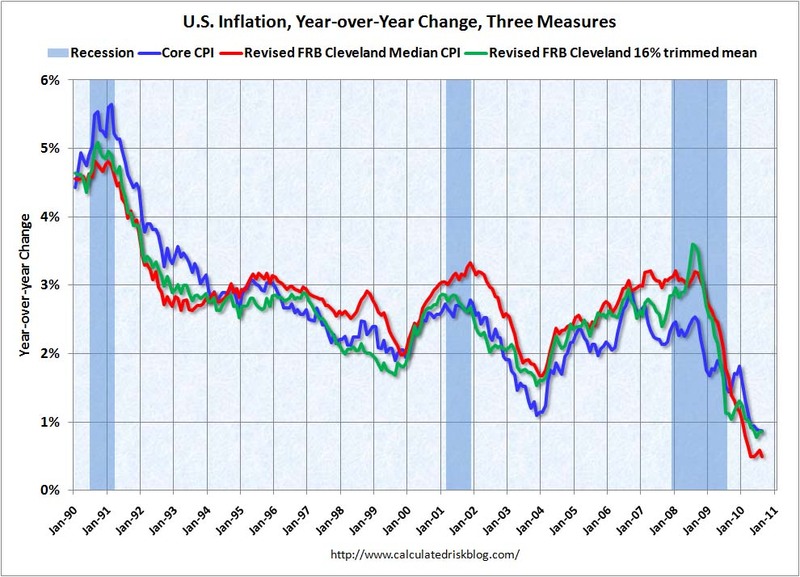 Prevent the next deflation – What’s left for the Fed? Should the funds rate approach zero, the question will arise again about so called nontraditional monetary policy measures. I first discussed some of these measures in a speech last November. Thanks in part to a great deal of fine work by the staff, my understanding of these measures and my confidence in their success have been greatly enhanced since I gave that speech. Without going into great detail, I see the first stages of a “nontraditional” campaign as focused on lowering longer-term interest rates. The two principal components of that campaign would be a commitment by the FOMC to keep short-term yields at a very low level for an extended period together with a set of concrete measures to give weight to that commitment. Such measures might include, among others, increased purchases of longer-term government bonds by the Fed, an announced program of oversupplying bank reserves, term lending through the discount window at very low rates, and the issuance of options to borrow from the Fed at low rates. I am sure that the FOMC will release more specific information if and when the need for such approaches appears to be closer on the horizon. 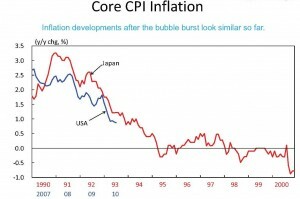 Deflation Threat: Is America another Japan? 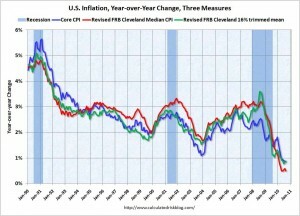 July 30, 2010 / 1 Comment on Deflation Threat: Is America another Japan? 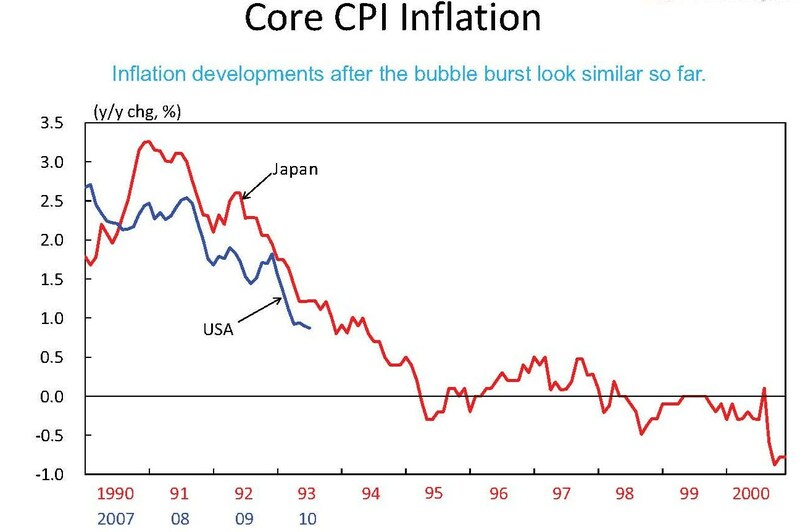 Does America face Japanese-style deflation? The 10-year Treasury yield, the benchmark for U.S. consumer and corporate borrowing, rose to 4% for the first time since June. The move extends a steady increase by Treasury yields, which move inversely to prices, lifted by a combination of stronger economic data and the barrage of debt issued by the government to meet its financing needs. Recent Treasury auctions have met with much weaker demand and Monday’s move comes ahead of more auctions this week, with the Treasury Department set to sell $82 billion of Treasury notes and bonds. 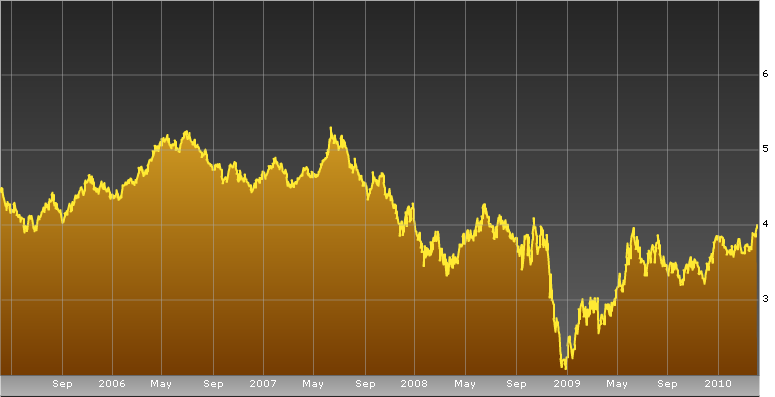 The 10-year yield is a key benchmark for mortgage rates and other consumer and corporate lending. My best take on the surge of 10-year rate is: this is due to more of investors’ early worry about US fiscal situation and rising long-term inflation expectation; rather than expectation of strong economic recovery. Remember, the Fed can’t directly control long-term interest rate. IF the 10-y rate continues to rise as the result of rising inflation expectation, the Fed will be forced to raise short-term interest rate. This will put a brake on the tepid economic recovery, potentially causing a double-dip scenario, like the recession in 1981. Jim Grant holds the view that high inflation is ahead of us, and Rosenberg thinks deflation is a bigger risk, so treasury/bond securities are not bad bet.